Google has always lived up to the expectation, where its fans always believe that the tech giant will provide something very unique and innovation. Just like the company Philips, Google has been known for its creative lines. Like every year, this year also Google arranged a doodle competition in India, which seeks potential and innovative mind. This competition celebrates ‘Children Day’ on the very auspicious birthday of Pandit Jawaharlal Nehru on November 14 and also promotes little minds who can deliver excellence in future. Every year, Google arranges this doodle competition in prior days of Children’s day. This day celebrates India’s first prime minister’s birthday and his love for the children and also for the community. As he always believed in the power of young minds, respecting the very thought, Google induces young minds to be innovative and displays their talent at world stage through this competition. 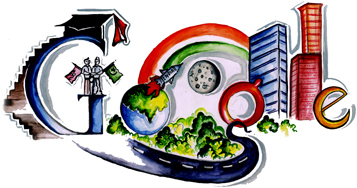 The winner entry of doodle competition is displayed on the Google homepage on the Children’s day. Google has named the competition as ‘Doodle4Google’. This year, Google team has selected doodle work by Vaidehi Reddy, who is from APS, Pune. Her drawing represents the state Assam and many cultural outlooks of the community. This year the theme was ‘A place in India I wish to visit’ and Vaidehi’s artwork perfectly stitches her own imaginary thoughts about Assam. The doodle contest was held across 1700 different schools in 50 different cities. According to Google, they have received more than 800 entries this year for this competition and all of them were very innovative. However for the competition’s purpose they have chosen Vaidehi’s artwork, which according to the team, is a perfect example for a combination of art and a child’s creativity.